We just had an earthquake along a fracture zone within the Explorer plate. The Explorer plate is the northernmost subducting plate in the Cascadia subduction zone system. I post material about the CSZ here and here. Below is my earthquake report poster for this earthquake. The M 5.2 earthquake is plotted as an orange circle and I include the USGS moment tensor. Here is the USGS web page for this M 5.2 earthquake. Based upon the bathymetry and the papers below (Dziak, 2006; Audet et al., 2008 ), I interpret this earthquake to be a right-lateral strike-slip earthquake. 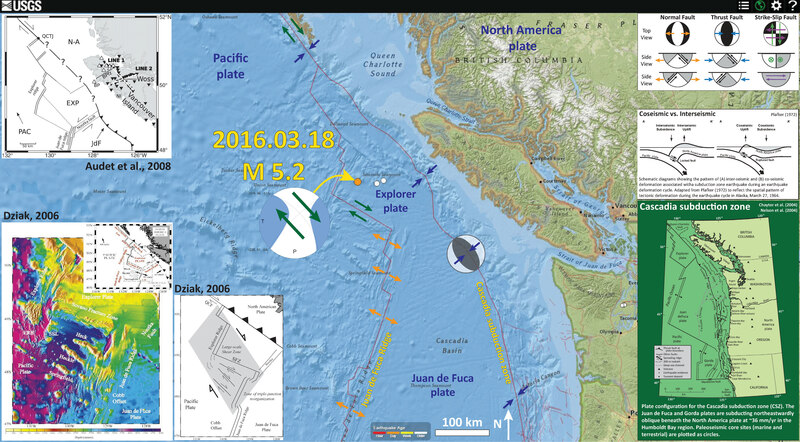 In 2012/10/22 there was a subduction zone earthquake along the plate boundary near Haida Gwaii, the island to the northwest of the label “Queen Charlotte Sound.” Here is the USGS web site for the M 7.8 Haida Gwaii earthquake. Earlier maps show this boundary to be strike slip (large earthquakes to the north were strike slip), but the M 7.8 clearly shows that there is compressional tectonics here. Looking at the bathymetry available, there is also an accretionary prism here as well. Note that I label this boundary as strike-slip and convergent. I include some inset maps from Audet et al. (2008 ) and Dziak (2006). Each of these authors have published papers about the Explorer plate. Dziak (2006) used bathymetric and seismologic data to evaluate the faulting in the region and discussed how the Explorer plate is accommodating a reorganization of the plate boundary. Audet et al. 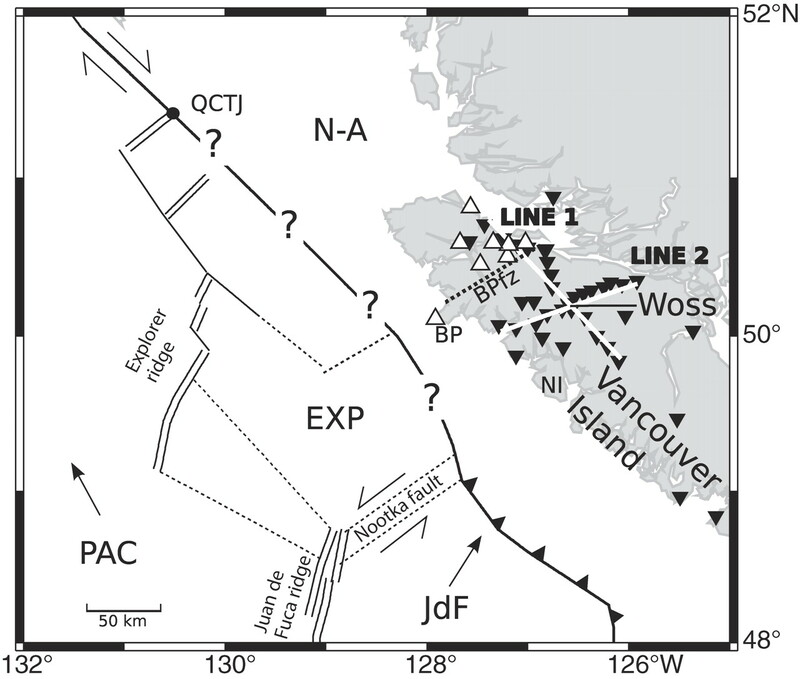 (2008 ) use terrestrial seismic data to evaluate the crust along northern Vancouver Island and present their tectonic map as part of this research (though they do not focus on the offshore part of the Explorer plate). I include these figures below along with their figure captions. The Cascadia subduction zone is an approximately 1,200-kilometer convergent plate boundary that extends from northern California to Vancouver Island, Canada (inset figure). The Explorer, Juan de Fuca, and Gorda plates are subducting eastwardly below the North American plate. Seismicity, crustal deformation, and geodesy provide evidence that the Cascadia subduction zone is locked and is capable of producing a great (magnitude greater than or equal to 8.5) earthquake (Heaton and Kanamori, 1984; McPherson, 1989; Clarke and Carver, 1992; Hyndman and Wang, 1995; Flück and others, 1997).